What have I lost? Too much. What am I grieving? Too much. There are times I feel the overwhelming sense of loss fall through me and I can’t catch the tears in a butterfly net. Off they flutter, landing on this memory or touching on that ache in my soul. And I stumble along clumsily with my net not even thinking of what I would do if I were to catch them. Watch the shimmer on their wings, perhaps, as they open and close while watching me. The tears might turn to sobs and these would be the times when I convince myself that I am, as they say, “hormonal” and wipe away the ugly tears. I don’t think I know anymore what it is I grieve for. What could there be left for me to reconcile? I’m nearly 41. I’ve experienced far too much and there it is, isn’t it? I have lived too much in far too little. Too much death, too much trial, too much darkness, too much pain, too much pressure, too much of the this and the that. 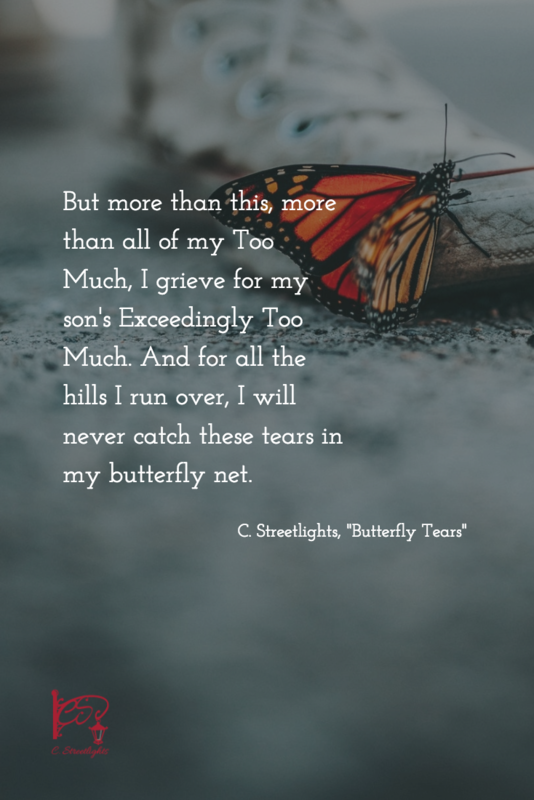 But more than this, more than all of my Too Much, I grieve for my son’s Exceedingly Too Much. And for all the hills I run over, I will never catch these tears in my butterfly net. In preschool my son lost his great-grandmother, whom he loved dearly, followed by his great-grandfather in Kindergarten. By the time my son was in first grade, he had to worry about his father who underwent four emergency surgeries. I won’t list every grade’s trauma, but each grade had one, including trying to understand my sexual assault (without knowing what had happened) and losing a baby. This soon-to-be 17 year old boy will never know a truly simple childhood, and maybe I am naive in thinking some children do, but it is for this I grieve. For all my worrying, my boy is becoming who he is meant to become. He amazes me. He is gentle and kind. He is sensitive and loving to others, thoughtful and always seeks out those who have special needs to befriend them. My son quietly goes about his life, his presence setting the standard for others to be better. He doesn’t even know the power of his own influence and perhaps it is better that way. This is my son, and I am extraordinarily proud of him. My heart breaks for all that was lost for him as he has grown up, but I am grateful for the strength it has given him — even if he and I both don’t recognize it yet. And perhaps this is the reason I am only able to chase these butterfly tears at the moment. I don’t know yet where they might land.